The 2019 random cash giveaway at Mr Green Casino attacks in 2 separate sections and gives away a total of €20,000. Win your share of €20,000 in March 2019! March on the streets of London, explore the most beautiful city on Earth – and win money. The latter one is thanks to the 2019 random cash giveaway organized by Mr Green Casino. 100 lucky players will share a total prize pot of €10,000, with the first prize being €1,500. 50 players will win €50, that’s the least you can win in this promotion, so make sure not to miss out on this. Prizes vary from €50 up to €1,500! Those who have more ambition, will want to play the Tower Bridge tournament. That one rewards only the 10 best players – which means higher prizes too, obviously. The first one takes €2,750, 2nd spot earns you €1,750 and the 3rd, €1,250. The 4th wins €1,000, the 5th gets €750 and the rest takes a €500 cash prize. Not bad, is it? All you need to do is wager at least €5 on your favourite slots. All Mr Green Casino slots apply! Make sure you click to find out all the details about Mr Green Casino. 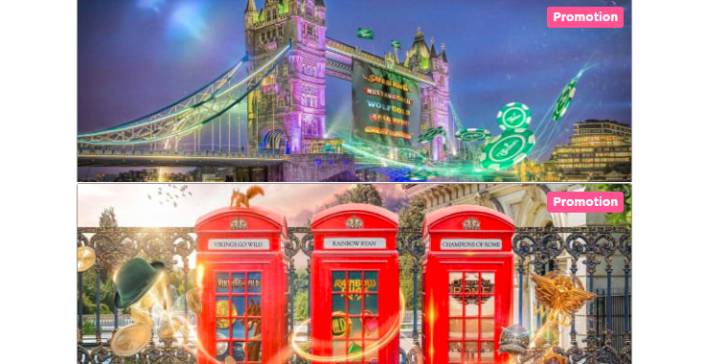 Check out the latest online casino promotions in the United Kingdom! To learn more about the best Online Casino Sites in the United Kingdom, have a look at the Online Casino Reviews section.